For many lovers of this sport Sal is the perfect place. 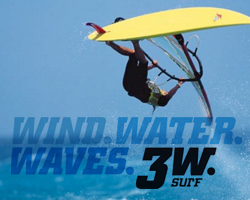 The winds (trade winds) blowing steadily from November to May and the spots where you can practice the sport are numerous. Santa Maria - The town beach, next to the pier, much frequented by kitesurfers here have the ability to travel great distances. The white sandy beach stretches for 8 km. If you have your equipment Remember to place on the beach after the village Djadsal, because from the jetty at Djadsal there are schools that make the courses. Spot on the left side off walls, suitable primarily for freestyle and freeride. Serra Negra-If you go down to Santa Maria, and you leave behind the Hotel Albatros, going north you will reach the beautiful wide beach of Los tiburones "(sharks) and do not be intimidated by the name! However for the rash is an excellent spot to learn to jump and perfect spot for kitesurfers here engages in real feats. Wind side on shore, port tack helps us to return quickly. Accessible only by pick-up or jeep. Ponta Leme Velho - Located in front of 'Lim Bedje hotel, right in front of the center of Josh Angulo and is one spot available and suitable for people who want to learn or ride a freeride freestyle. Tack on the left side off and upwind of the country. When the sea is a bit 'thick can form the shore break. From here you can start with upwind and out of Ponta Leme Velho, (then exit from the bay), where you can find waves up to a couple of meters, and during swell even larger. Ponta Preta - If you think you have already seen everything you are greatly mistaken. Take a taxi, rent a pick-up, or take a walk, but do not forget to come in Ponta Preta! It is located about 1 km after Ponta do Sino. (Sal anyone knows the way to Ponta Preta!). Here it is a mecca for surfers, the legendary spot of Trilogy Windsurfing and Kite Board Pro Tour on these waves is at home Josh Angulo, who know every inch of the bed until really dare 'last moments ... I recommend you do not try to imitate him ... It 'a beautiful sandy bay with a touch of rock. You enter the water from the lee shore, being very careful with the shore break, which can chew on the days biggest equipment before you even be wet! If you fall into the waves and you lose the equipment, prepare to retrieve the rocks. And 'the most beautiful wave of Sal, and according to many one of the most beautiful view of the planet! 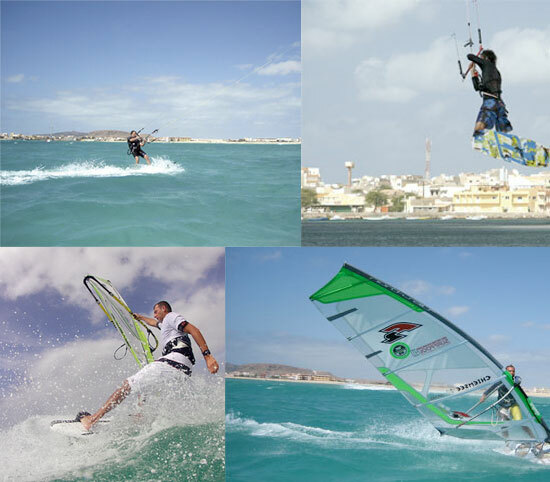 Here is only for real experts, who can indulge themselves in numbers between giant waves with windsurfing, kite surfing or ... you choose! All the best wave rider in the world, we have gone out at least once! It 'a wave fits only kitesurfers EXPERTS fringes of the tip and roll over the rocks for several hundred meters until you reach the beach and join the shore break. The wind enters starboard side off shore up to 25 knots. L 'wave has three sections: if the wind is strong, the main peak may have some chop, but then the' wave becomes glassy and Tubantia. The swell to work the best spot is from N-NW, while those from W breaking waves are much faster. The advice is to take good measures and understand the timing of 'wave before attempting to enter.